1. The night before, combine the dry ingredients in a large bowl. 2. Stir in the milk, cooled butter and the vanilla. The mixture should be creamy and loose. 3. Cover the bowl with plastic wrap and set aside overnight at room temperature. 4. 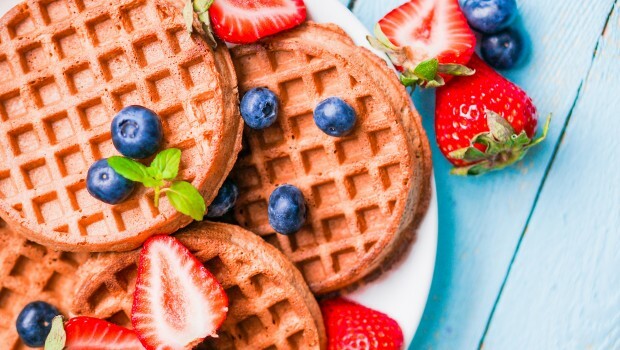 In the morning, brush the waffle iron lightly with oil and let it heat up. 5. Separate the eggs and stir the yolks into the batter. 6. Beat the whites until they hold soft peaks, then fold them into the batter gently. 7. Spread enough batter onto the waffle iron to barely cover it; bake until the waffle is done, usually 3 to 5 minutes. 8. Serve immediately with fresh berries. Note: These waffles hold well in the refrigerator for several days, or can be frozen for later.